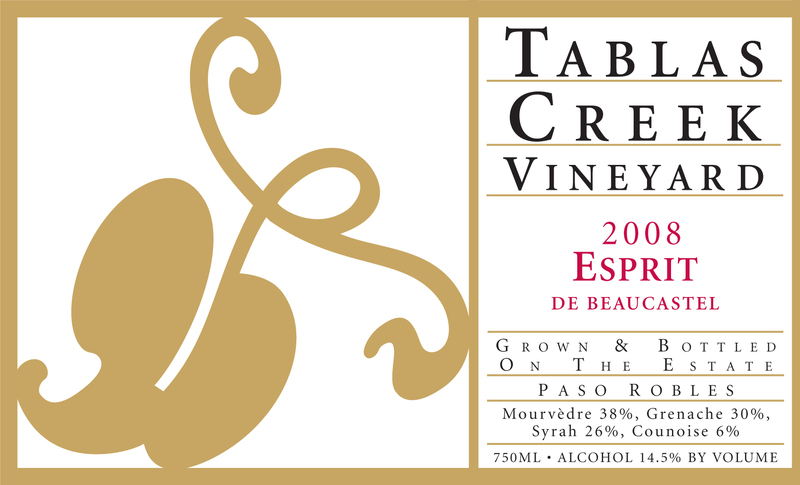 The Tablas Creek Vineyard Esprit de Beaucastel 2008 is a blend of four estate-grown varietals, propagated from budwood cuttings from the Château de Beaucastel estate. The wine is based on the dark red fruit, earth, spice and mid-palate richness of Mourvèdre, with additions of Grenache for forward fruit, approachability and lushness, Syrah for mineral, aromatics, and back-palate tannins, and Counoise for brambly spice and acidity. The 2008 Esprit de Beaucastel shows a deep, spicy nose with waves of fruit alternating between red and black raspberry and cherry, grilled meat, balsamic, and licorice. The palate shows raspberry, currant and black cherry fruit highlighted by beautiful acidity, an appealing mintiness, and substantial but fine-grained tannins. The wine is remarkably approachable despite its youth, and we think it will only get better. Enjoy over the next two decades. The 2008 vintage was our second consecutive drought vintage, with low yields, cool-climate characteristics, and a persistent elegance across both whites and reds. A late spring and moderate summer combined with beautiful harvest weather to produce gradual ripening and red wines that were unusually fresh and approachable despite appealing lushness. Syrah began the harvest of our reds between September 9th and October 7th, followed by Grenache between September 23th and October 24th, Counoise between October 2nd and 28th, and Mourvedre between September 30th and October 30th. The grapes were fermented using native yeasts in open and closed stainless steel fermenters. After pressing, the wines were moved into barrel, blended, and aged in 1200-gallon French oak foudres before being bottled in July 2010.